In the first years of the 17th century, small numbers of English Puritans broke away from the Church of England and committed themselves to a life based on the Bible. Most of these Separatists were farmers, poorly educated and without social or political standing. The Separatists were persecuted in England, and many fled to Holland where their religious views were tolerated. They remained there for almost 12 years. The people we know as the Pilgrims have become so surrounded with legends and tales that we tend to forget that they were real people – but they were placed in extraordinary situations. And yes, they did wonderfully brave things. Basically, they were English people who had suffered persecution in their homeland, and were searching for a place where they could worship God as they chose. On December 20, 1620, the Pilgrims dropped anchor in Plymouth Harbor. The spot they chose had been named “Plimouth” on a 1614 map made by Captain John Smith, and thus it was named. The men spent three days surveying for a settlement site. They finally decided on a recently abandoned Native American village named Patuxet, largely for its defensive position. The settlement would be centered on two hills: Cole’s Hill, where the village would be built, and Fort Hill, where a defensive cannon would be stationed. And the local Native Americans had cleared much of the land, which would make planting relatively easy. Due to a winter storm, everyone remained on the Mayflower for the following two days. And finally on December 23, the men began felling trees and collecting materials to build shelter for their families, returning each night to the ship. Women, children and the infirm remained on board the Mayflower; many had not left the ship for six months. The first structure, a “common house,” took two weeks to complete in the harsh New England winter. In the following weeks, the rest of the settlement slowly took shape. Many of the able-bodied men were too sick to work, and some died of their illnesses. Thus, only seven residences (of a planned nineteen) and four common houses were constructed during the first winter. They surrounded the entire compound, which they called Plymouth Plantation, with a stockade fence. 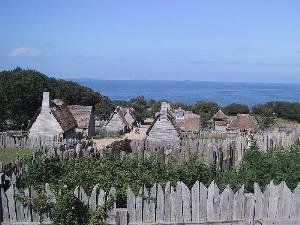 The first street in Plymouth Colony led from the harbor up the hill to the cannon. At the intersection of the first cross street stood the Governor’s house. Everyone had access to the brook where flagons were filled with drinking water, and where clothing was washed. The soil wasn’t particularly fertile, and the early onset of winter made for a short growing season. So the colonists adopted Native American crops—maize, squash, pumpkins, beans, and potatoes. They learned farming techniques from the Wampanoag, such as proper crop rotation and the use of dead fish as fertilizer. They also planted Old World crops such as turnips, carrots, peas, wheat, barley, and oats. Many of the Pilgrims turned to the sea to earn a living. They became fishermen, sailors, and merchants. They took cargoes of fish, timber, and surplus crops to the West Indies, to England, and to Spain, and brought back articles they couldn’t make at home. They harnessed waterpower and established grain mills and sawmills. The men and women who founded Plymouth Colony were not Puritans. The Puritans were a totally different sect—they wanted to reform the Church of England. They established the Massachusetts Bay Colony a decade later. The people who sailed into Plymouth Harbor on the Mayflower in 1620 weren’t Pilgrims either. They were Separatists, because they wanted to make a complete break from the Church of England—they believed that it was too corrupt to be reformed. They were persecuted for their beliefs by the English monarchy and to a lesser degree by the Puritans. In 1608, a few congregations fled to Holland. They were referred to as pilgrims because of their sojourns in search of religious freedom. At some point, the word was capitalized, and they have been known as Pilgrims throughout history. Although they were able to worship freely in Holland, it was difficult for them to make a living. When they discovered that their children were slipping away from the Separatist faith and were becoming more Dutch than English, they began to make plans to travel to the New World. 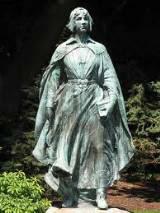 Not much is known about Mayflower passenger Elizabeth Hopkins. She married Stephen Hopkins in either 1617 or 1618 at Whitechapel, England, and had a daughter Damaris born sometime around 1619. Elizabeth was Stephen Hopkins’ second wife. The name of his first doesn’t appear in any records. In 1620, Stephen Hopkins brought his wife and their baby Damaris on the Mayflower—and his children from his first marriage, Constance and Giles. Elizabeth gave birth to a son, Oceanus, while they were at sea. Stephen had been recruited by the Merchant Adventurers to provide leadership for the colony and to assist in the colony’s ventures. He was a member of a group the Pilgrims called “strangers,” which comprised more than half the passengers on the Mayflower. These strangers signed on in London to help defray the cost of sending a ship to the New World and to further the chances of the colony’s survival. They included merchants, craftsmen, skilled workers and indentured servants, and three young orphans. All were common people, and about one-third of them were children. Eleanor Billington ,wife of John Billington and mother of Francis and John Billington II, all Mayflower passengers, was born about 1582. Eleanor was one of only five adult women to survive the first winter, and one of only four who were still alive to partake in the harvest celebration in the autumn of 1621. The Billingtons were not part of the Pilgrim Separatist community. Her family is regarded as being rather ill-behaved. Young Francis Billington shot off his father’s musket in the Mayflower’s cabin while it was anchored at Provincetown Harbor, showering sparks around open barrels of gunpowder. A few months later, John Billington the younger wandered off into the woods, and was taken by the Nauset Indians to Cape Cod, where he lived for about a month before he was returned.